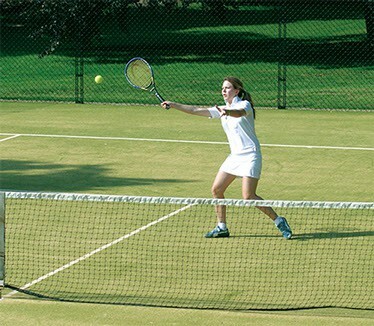 Tenniturf is a sand-filled artificial grass tennis court that is also well-suited to five-a-side football, hockey and cricket. 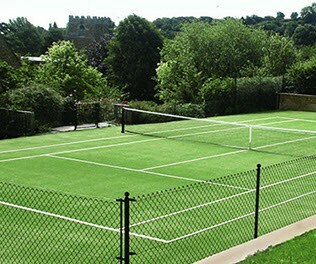 Tenniturf is a traditional sand-filled artificial grass. The sand comes right up to the surface of the polypropylene fibres to avoid flattening with use. It has been tried and tested for more than 30 years, looks great and, when given proper and regular maintenance, will last for many years. Tenniturf is a medium pace surface and will give good grip when wet or dry. Drawbacks: When it is wet the balls will shoot through faster, the player is constantly in contact with the sand on shoes, hands etc. It needs regular brushing. The sand needs to be swept regularly when in heavy use, such as at a club, or it will consolidate and need extensive removal and replacement of the sand infill. 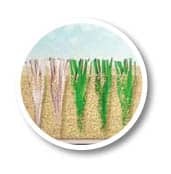 The common theme of regular brushing, removal of leaves and regular spraying with moss killer four times per year remains throughout our product range. As part of our commitment to completed projects we offer our own after care and maintenance service, so please feel free to contact us for further information. N.B. Tenniturf must be maintained regularly. If this is carried out the court will give many years of good service. If it is allowed to get excessively mossy it is difficult to overhaul, in comparison to Sporturf, Pladek or Savanna.